This week, New York City mayor Bill de Blasio announced the biggest update to the city’s Air Pollution Control Code since 1975 at an Earth Day event in Union Square. The plan will focus on updating regulations for pollution sources that currently have little or no emission control standards. “The air today in New York City is cleaner than it’s been in more than 50 years. And we’re going to work to make it better still. And for that reason, I’m proud to announce today that we’ll be updating and strengthening the city’s Air Pollution Control Code,” said de Blasio. 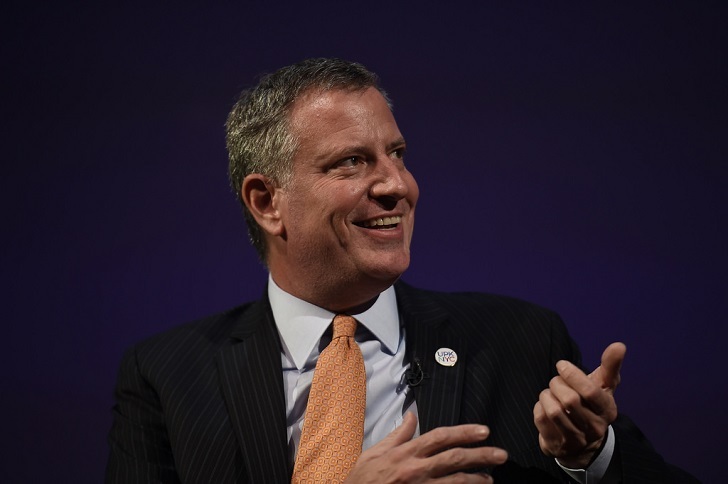 De Blasio is building upon former Mayor Michael Bloomberg’s successful green initiatives, which follow the long-term sustainable PlaNYC blueprint. Bloomberg’s achievement of helping the city reach the cleanest air quality levels in more than 50 years was largely a result of phasing out the use of the most heavily polluting heating oils. The proposed new revisions to the air code focus on unregulated emissions such as “tiny particulates generated by commercial char broilers, fireplaces, food trucks, and refrigeration vehicles, which are a leading contributor to asthma,” according to the Mayor’s office. The bill, authored by Councilman Donovan Richards, would require these fine particulate generators to use only natural gas or renewable fuels to reduce pollution. The New York City Council Committee on Environmental Protection will hold a hearing on Intro 271 that would codify the revisions to the air pollution control code. By being proactive, the de Blasio Administration and City Council are trying to avoid a similar situation to what recently happened in Paris, France, where the air quality was rated worse than Beijing, China, forcing the French capital to take emergency measures to reduce dangerous air pollutants that threatened public health. Speaking at an Earth Day event at Union Square, New York City Mayor Bill de Blasio announced the biggest update to the city's Air Pollution Control Code since 1975. The proposed revisions to the air code focus on unregulated emissions such as "tiny particulates generated by commercial char broilers, fireplaces, food trucks, and refrigeration vehicles, which are a leading contributor to asthma," according to the Mayor's Office.